In Bangladesh, the fruit is called lau লাউ or in the Chittagong and Sylhet region kodu or xodu and is served with rice as a common dish. In Pakistan, the calabash is known as kaddu or lauki in Urdu, and kaddu in Punjabi and Pashto. 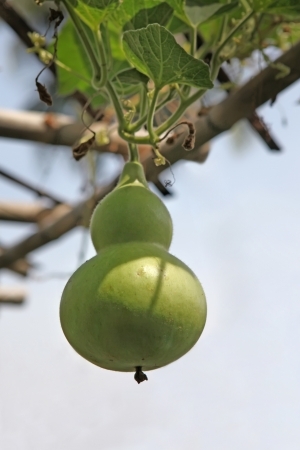 The plant is cultivated on a large scale as its fruit is a popular vegetable. In traditional medicine, the fruit is considered to have cardiotonic with anti-hyperglycemic an antilipidemic properties. The claims are supported by recent research. The fruit also has remarkable antioxidant activities which have been demonstrated in a number of studies.